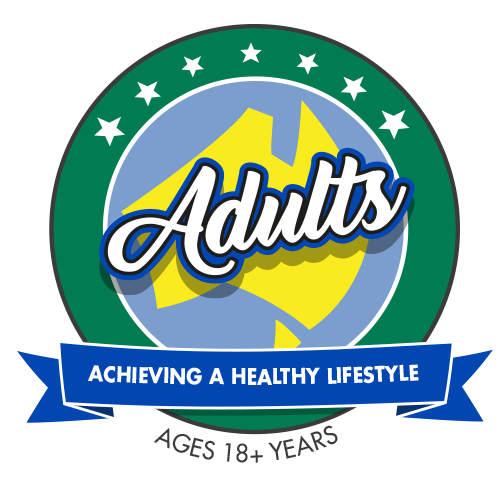 The Adults program is a fun, friendly and effective style of martial arts and self defence training. The program is a great way of improving your fitness, strength and flexibility. Training will leave you feeling excited to improve your confidence, health and mindset. AMA has over 115 classes operating 7 days per week, giving you the flexibility to suit your busy lifestyle. This program will see you progress through the sport of Taekwondo with added elements from many martial arts to ensure members are confident to defend themselves and always challenged with something new. 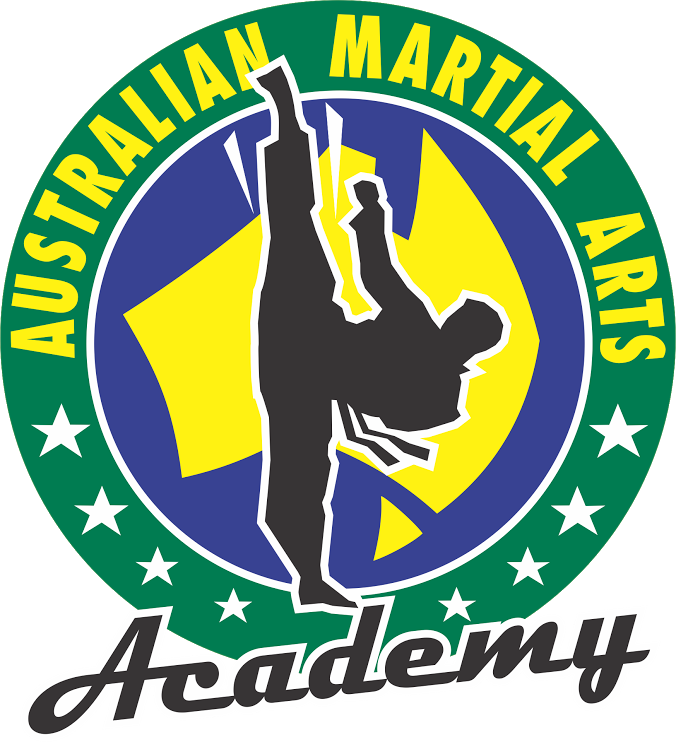 Australian Martial Arts Academy prides itself in having the best quality instructors and students, but most importantly still maintaining that friendly environment in which your goals as an individual member are met, with Adults classes run by certified award-winning Head Instructors and Master Instructors. Adults classes are available for beginners all the way up to black belts with a variety of specialty and advanced programs also available. At the Australian Martial Arts Academy we believe it is never too late to start! We have many great classes available including our family class in which mums and dads, even grandparents can train with their kids – be great active role models for their children and have even more fun than the kids while doing so! It is a great way to have fun and share quality time with your kids. Martial Arts like Taekwondo involves all major muscle groups in the body and because of this it is one of the highest kilojoule burning sports that also improves core strength and flexibility to provide the energy to enjoy life. The best thing is that as an individual sport you can build up in your own time and watch your journey of improvement. I travel 2 hours just to train at this academy and it’s so worth it! This academy is a second home to me. Not only do you get exceptional world class learnings and skills, you get treated like family. The instructors are always so helpful and will go above and beyond to support and encourage you. I can’t recommend this place enough. Joining AMAA was the best decision I ever made. I started here to get fit and build a healthier lifestyle but I ended up getting so much more from the sessions. I didn’t think that I would enjoy gaining all the belts as much as I did- it’s so rewarding and motivating. This place is great, the people are so positive and even after the worse day at work I leave feeling awesome. I’m fitter, stronger and doing things better then I did in my 20’s and loving getting away from a gym. Have been going here for over 5 years and it has dramatically improved my self esteem and fitness. This place has an amazing sense of community. “I thought it would be too challenging with kicks and sparring …but its amazing when you start at the beginning with great training, step by step, it becomes easier and helps be believe in myself and say WOW I can do this. Happy 35 years, AMA. I’ve been training with you for just six, but when I was asked recently whether taekwondo gave me a ‘workout’, I thought I’d write down a few of the things that keep me coming back. The quick answer is yes! But it doesn’t stop at a workout. As a 1980s teenager I did my share of cardio fitness aerobic classes (New Body, Step, anyone?) Taekwondo does that and more. We drip sweat! Depending on the teacher, outside air temperature or any other variable (the Grand Master can be unforgiving in those weeks after Christmas), expect a warm up, stretches then 20­–40 minutes of heart-pounding exercise. And we do it to music! I’ve never figured out who puts together the workout tracks, but hats off. They’re great. We all train together. As a beginner, I learned so much from the black belts’ patient tuition in class. I love giving back now, and helping others is one of the best ways to remind yourself of the techniques again. The sheer pleasure in ‘getting’ a technique is something you’d never get in boot camp. I remember my incredulity in first learning a double turning kick: this is a turning kick on one leg, immediately followed up with a second kick with the other. What? How can I bring up that leg before I’ve even landed the first? It’s now second nature. And you move on, learning and applying more difficult skills. It’s impossible not to smile watching someone master something new. And the breadth of the curriculum makes this workout different. In any class you could be practicing kicks, self-defence moves, sparring ….or meditating. I used to captain my school tennis team; while I still think it is a beautiful game, those moments when I revelled in my control and skill seemed too rare. In taekwondo, you don’t need a partner or an opponent. You’re competing against yourself. Showing up, training, perfecting a technique will only matter to you, in the end. And the real difference? We’re asked to reflect on who we are, and where we’re going. 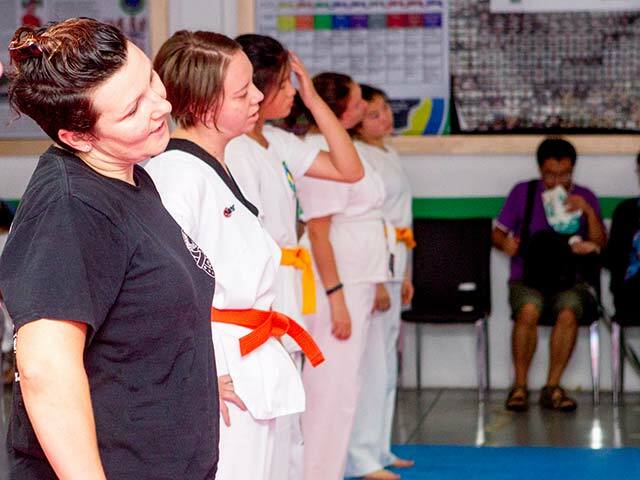 Setting goals in life as well as sport is the backbone of Australian Martial Arts’ operation. It’s working for me. I started at AMA..as a matureish-aged person (37), never having done a sport before. I had always envied kids who did martial arts…but i didn’t think I could. It was almost as a bit of a joke that i decided that i wanted to get a black belt…. i figured I had to at least be doing a martial arts if i wanted to have any hope of actually getting one. Four and a half years on, I am now a first dan black belt, and considering grading for my second dan…and whilst I can’t do no-handed cartwheels, back flips and the like, I am fitter, more flexible…and happier then i have ever been….and you know, I can keep up with my kids…and still get away with that little black dress if I so choose =D. The things I love about doing taekwondo at AMA, are the diverse range of instructors that we get exposed to…Miss Sarah’s eye for technical detail, Miss Bushra who pushes your body just that little bit further than you thought it could go, Mr Richard who makes every lesson fun, Mr Hakan who unpacks every move, and expects speed, and of course Grandmaster Ridvan whose charisma is palpable. Every class is different, and you feel both mentally and physically engaged……it’s a bit of an addiction really. And being such a great place, it seems that great people are attracted, I have met fabulous people, and made some very fun friends..it’s easy as being open, warm and encouraging is part of the atmosphere of the place. Come along and find out for yourself! Book in HERE to secure your spot in Australia’s best adult program today! Receive your first 3 classes + FREE T-Shirt & Martial Arts Belt only $29.95! (save up to $155). THIS COULD BE A GREAT SPOT FOR 5-7 CLIENT TESTIMONIALS AND THEY CAN BE SHORT AND SWEET AND SLOT RIGHT INTO THIS SECTION IN UNDER TWO LINES OF TEXT.